Good morning everyone! I typically enjoy sharing tutorials and pictures of my work here, but I wanted to mix it up a little bit by giving you my top five recommendations for starting an art journal. 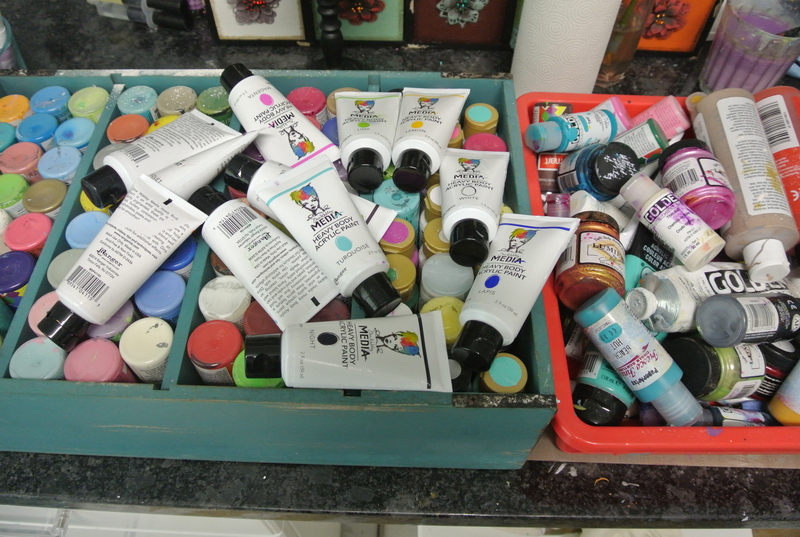 I think there are many people out there who would love to dip their toes into the mixed media waters but are afraid. They say to themselves “I can’t draw”, or “I don’t have the right supplies”, or “I don’t know where to start” etc. 1. LET GO OF YOUR FEAR AND HAVE FUN! There are so many choices out there now for art journals. You can purchase, or even make your own. Consider the type of art you think you might like to create. Also consider the size and paper type for a journal you think you would feel comfortable working in. I have used many different types of journals through the years: ones made of handmade paper (a little challenging), Strathmore mixed media books in varying sizes (my personal favorite right now! ), watercolor paper books, books with paper made from heavy cardstock, and the Dylusions journals (also very good). These types of journals can be found in most local Hobby Lobby or Michaels stores now. Of course Amazon is also an option! 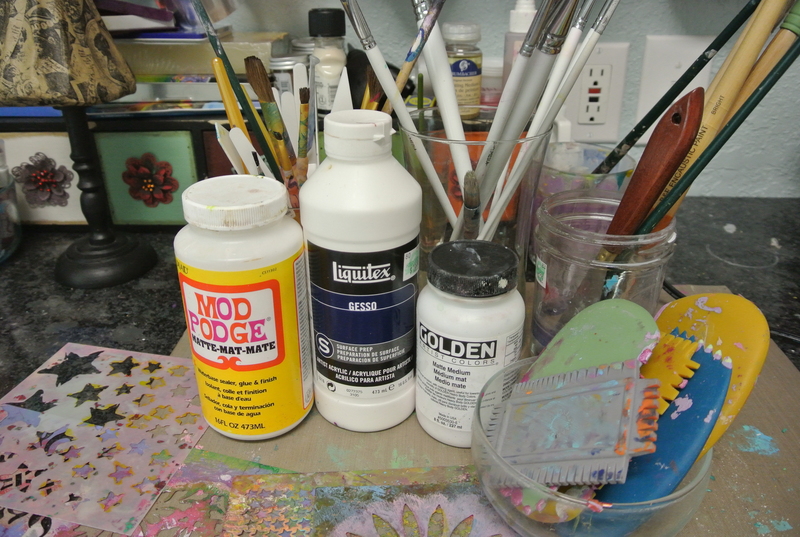 gesso–this is a must have. You can erase virtually any mistake with a coat of gesso. It’s my best friend! stamps-background texture stamps, word stamps, letter stamps (I like the ones at Michaels that cost $1)–this is an area of supplies that can be built up over time. Pens for drawing and doodling. I like the Faber Castell Pitt pens. I am not ashamed to say that I am on online art class junkie. I like these types of classes because they are self paced. There are so many amazing artists out there that are willing to share ideas and techniques through online classes, YouTube videos, blog tutorials, and even live teaching events and retreats. Go online and Google mixed media art. Find examples of art that you like and find out who the artist is. Check out their blogs or You Tube video channels. Browse Pinterest for styles of art that you might be interested in recreating. For a long time I was so worried about finding “my style”. I don’t worry about that anymore. The more you learn, the more you find that you will start incorporating bits and pieces of many styles–and eventually YOUR style will emerge. Don’t be so quick to put yourself into a “style” box–experiment! Create a “background” journal. Fill an entire book with nothing but layered backgrounds. You can always add to these pages later. Create a journal based on a word. I just started a book for my OLW for this year, which was GROW. Start a quote journal. Collecting quotes that inspire you into one journal can be very uplifting! 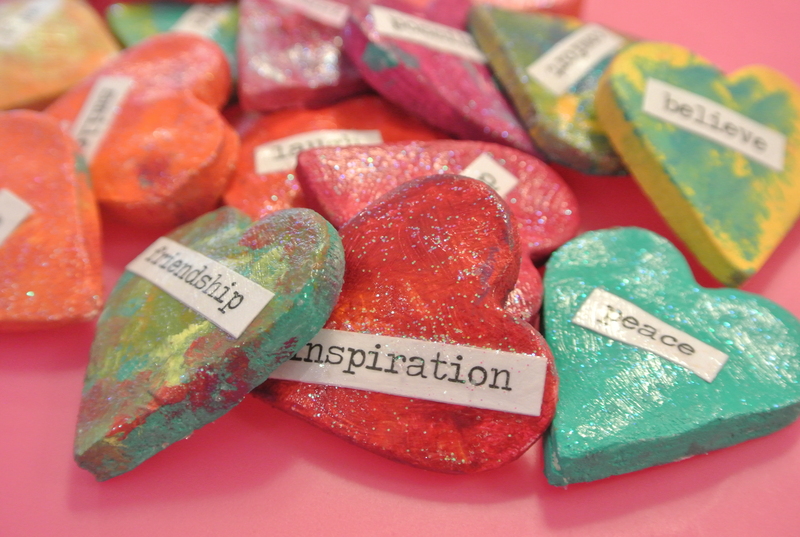 Create a color journal. Challenge yourself to use one palette or particular color through the entire book. Start a “Study the Masters” book. This is actually one I want to do myself. I always thought it would be fun to make a list of artists whose work I admire and try our their styles in one book dedicated to only that. Create a memory journal. Document the special moments of your life with a combination of photos of your family or from your travels, with paints, doodling, and written journaling. I hope you enjoyed this post, and feel inspired to start an art journal of your own if you haven’t already. I’d love to see your work, so feel free to post a link to your gallery or blog in the comments below! 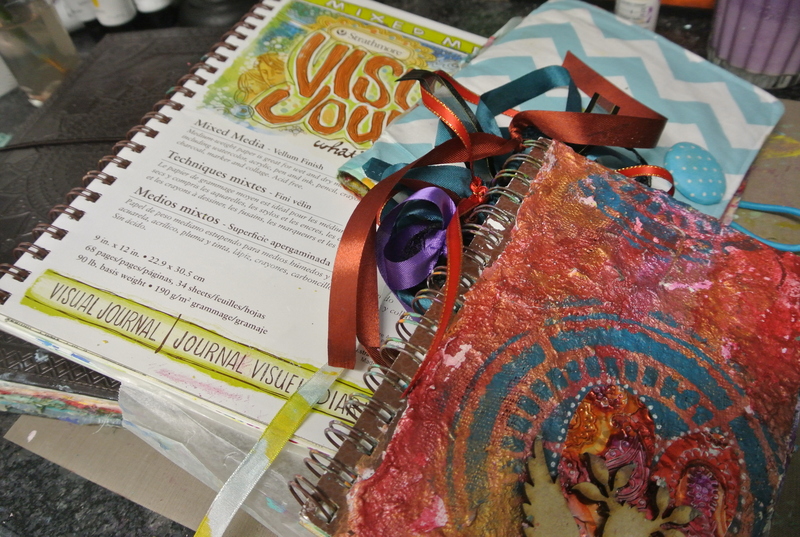 « Making Time for Art Journal Play and Exciting News!! Thanks for a great article Melissa! 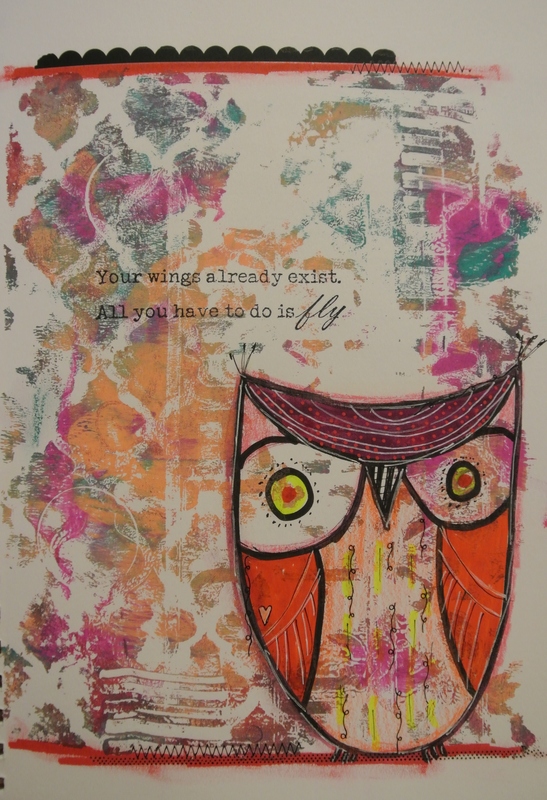 I have been dabbling in mixed media and art journaling for a short time and am still learning. I am in San Antonio and don’t have “art friends” to gather with in person. I am like you and love the online classes but I think it would be a blast to create in person with a group! I appreciate your encouragement and inspiration and am amazed at your ability to keep creating while managing your (what I imagine to be) full life! Thanks again! These are great, practical tips. Thanks. I’m just starting to dabble in art journaling. Very good tips for the new journaler and reminders for the seasoned one too. Going to tweet about this post now. Thank you for sharing! 🙂 glad you enjoyed the post. Thought I would share another perspective for you beginning art journalers out there! 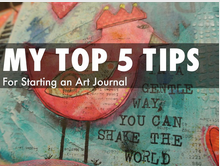 Enjoy Mel’s Top Five tips for starting and art journal! Thanks for writing this informative and succinct article. 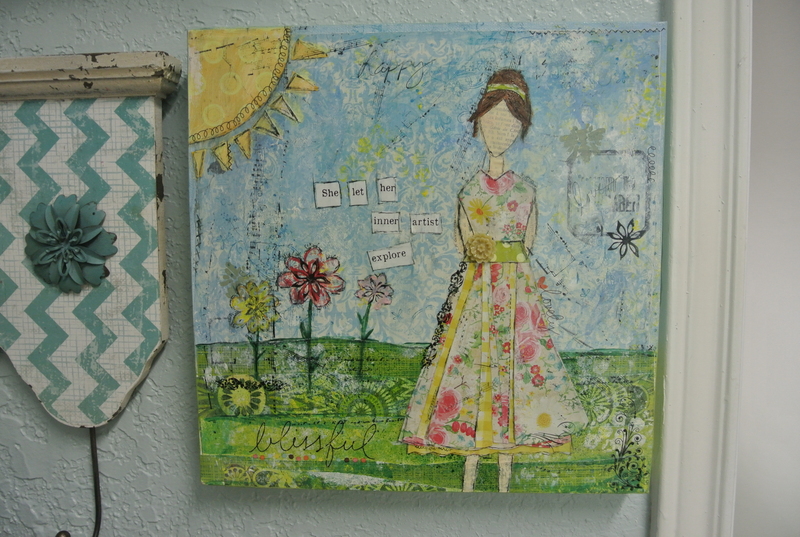 Although I have been an artist for very many years, mixed media journaling is new to me. I just started this year as the time I have to commit to my “regular” art has diminished. I am thoroughly enjoying using new media, trying new techniques and generally working in a way that is less result focused than it is process and pleasure focused. I am going to jot down your list of dedicated journal ideas for future reference. Thanks. Thank you! I’m glad that this post was helpful 🙂 art journaling has definitely been a pleasure for me. Hello and thank you for this post. I love the tips you’ve included but for me #1 is really hard to do.I always feel that I am not an artist therefore starting a journal will just be a waste of my time. I’ve started a cut and paste journal to slowly break in through art journaling. Really enjoyed these tips! I’m ‘working’ on my very first journal and I have to say the biggest set back is not having the ‘right equipment’ to make beautiful pages like the ones I’ve seen and fallen in love with all over the internet! I try not to let that stop me though.